No matter what sports you play, there are always chances of you getting a muscle bruise or contusion. Contusions are the second most common sports injuries after strains. Contusions are common, but many people still have questions about them, like "What is a contusion?" "How long will it take to recover?" "What are the most common treatment options?" The list definitely goes on. Just keep reading to learn more about "What is contusion?" and find the best contusion treatment in your case. 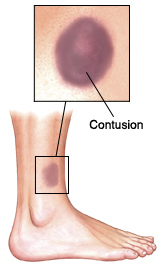 In simple words, a contusion is just another name for a bruise, which is usually caused by damaged blood vessels. The damage to blood vessels may be the outcome of a blow to the skin. Sometimes, the injured blood vessels start leaking into the tissues, which in turn will produce a bump on your skin. You most often see a purplish, flat bruise after an injury, caused mainly due to blood leaking out into your top skin layer – the contusion is called an ecchymosis. The good thing is that a contusion heals on its own in most cases, but sometimes, severe contusions may take you away from the game for a while, especially when they cause deep tissue damage. You may already have the basic definition of a contusion, but it is important to point out that contusions can be of different types and may be the outcome of different types of injuries. Depending upon the cause, you may experience different symptoms that will require a specific contusion treatment. A contusion caused by a direct blow from a blunt object to your skin is called muscle contusion that often crushes underlying muscle fibers and tissues. The blow is usually isn't hard enough to break the skin. Symptoms: Swelling and pain are the most common symptoms of muscle contusions, but you may also notice bluish discoloration of skin due to torn blood vessels. If blood collects within your damaged tissues, you may even notice a lump over your injury. Treatment: It is important to take rest and keep the affected area elevated. Using icepacks will also help reduce swelling and pain. If there is a lump that doesn't go away after several days, you may have to see your doctor who will drain it surgically. An impact to the head is usually the most common reason behind head or brain contusions. This may be the outcome of a fall, a car accident, or any sports-related accident. Symptoms: Minor contusions may not have any symptoms at all. If you have sustained a severe contusion, you may feel tired, confused, agitated, and emotional. Other common symptoms of brain contusions include memory loss, numbness, emotional disturbances, difficulty with motor coordination, and confusion. Treatment: The treatment will depend mainly on the severity of your injury. Minor contusions usually heal with any medical intervention, but it is important to consult your doctor after a severe contusion because it can cause comma. The basic treatment will include measures to avoid pain and swelling – this will also include measures to prevent hyponatremia, hypotension, and hypercapnia. Caused due to a forceful impact during accidents, sports, or a direct hit, bone bruises can be quite painful and may result in a contusion or a hematoma. Symptoms: The most common symptoms are pain and swelling. Treatment: You should take plenty of rest and use icepacks to reduce swelling and pain. You may also take anti-inflammatory medications (diclofenac or ibuprofen) to alleviate inflammation. See your doctor to rule out a fracture. Anything from ill-fitting shoes to blunt-force injuries can cause foot contusions. Symptoms: The damage to the blood vessels will cause pain and swelling. The contusion may turn red and then black – it will eventually turn greenish-yellow when your body absorbs the trapped blood. Treatment: Take plenty of rest, use icepacks and keep your affected food elevated. You may even have to use NSAIDs to reduce swelling and pain. You will notice a hip contusion after a hip injury caused mainly by a fall. Symptoms: You will experience pain that will aggravated by walking. You may also notice a lump with swelling at the site of your bruise. Treatment: The contusion treatment will include NSAIDs to reduce swelling with plenty of rest and the use of icepacks. Try to prop your leg and hip on pillows to keep it elevated. A pulmonary contusion refers to the bleeding and bruising of your lung tissue that may make it difficult to breathe. It usually happens after a direct injury to your chest. Symptoms: The most common symptoms include trouble breathing, chest pain, wheezing, and severe coughing that produces watery sputum or blood. Treatment: The severity of your injury will determine the best contusion treatment in your case. You will however, be taking pain medicines to reduce pain. Take deep breathes and cough hard to clear the air passages. You may require additional oxygen through a nasal cannula or a facemask. Suctioning is another option used when mucus or blood blocks your air passages. A chest tube may also be required to eliminate any blood, air or fluid accumulated around your lungs. Other treatment options include noninvasive positive-pressure ventilation and mechanical ventilation. A knee contusion is the outcome of any knee injury that causes swelling, bruising, or tenderness below the kneecap. Symptoms: A mild contusion will cause pain and swelling, but intense pain is usually the sign of a severe bone contusion. You will notice a bruise dark blue in color. Treatment: Minor contusions will heal without any medical intervention. You can however take OTC anti-inflammatory drugs to reduce pain and swelling. Take plenty of rest and avoid intense physical activity for some time. It is important to keep your leg immobilized if you have sustained a serious knee injury.